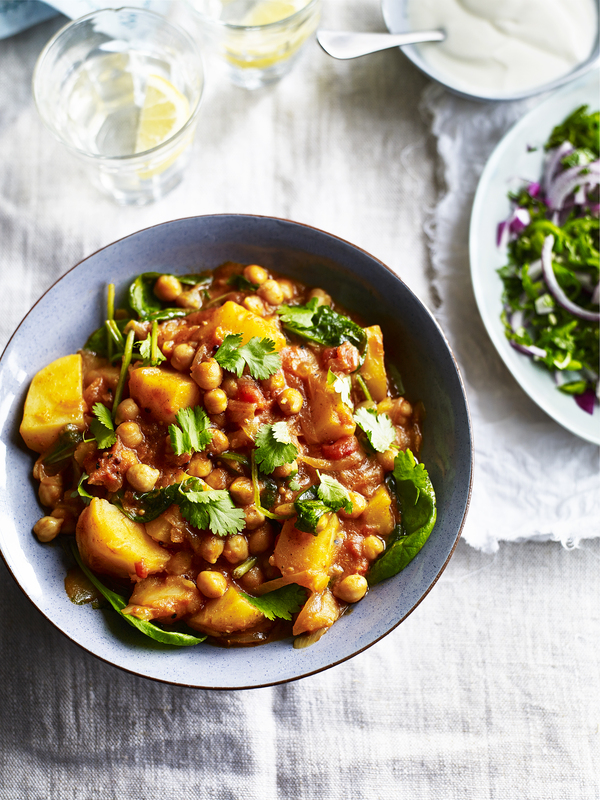 This chickpea curry recipe puts the potato under the flavoursome influence of Indian spices including masala and other fragrant ingredients such as ginger, coconut milk and tomatoes. The combination of smooth potatoes and chickpeas offer a fulfilling base to this curry recipe and acts as a great alternative to meat-based curries. In a large pan or casserole pot gently cook the onion for 5 minutes in the sunflower oil. Next add the garlic, ginger, garam masala and curry paste, continue cooking for 3 minutes over a medium heat. Now add the potatoes and chickpeas and give them a stir in the lovely spices making sure everything is coated. Pour in the tinned tomatoes and coconut milk and bring to a steady simmer. At this stage add a little salt and milled pepper. Continue cooking until the potatoes are soft. If the sauce feels a little dry just add a little water. Just before serving stir in the spinach and coriander and serve with yoghurt. Click play below t to watch the video for this recipe. Head to our video hub to view more potato recipe videos.